Check out this great new snack I found at Walmart on the other day. They are Chocolate Covered Soynuts made by South Beach Living. They taste amazing and you don't have to feel bad eating them. They taste just like chocolate covered peanuts but they are actually soy beans that have fried in soybean oil and then dipped in dark chocolate. The nutrition info is 100 calories, 6 grams of fat, 2 grams of fiber and 3 grams of protein. 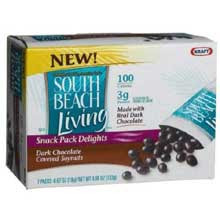 It is such a tasty and healthy snack for a little less then $4.00 for a box of 7 packages and only 2 P's per serving. All I can say is Awesome! You've got to try them. You can find them in with the protein bars and powders at Walmart. Today is day 4 of the Pudget 30 Day Challenge! I did level 2 of the 30 Day Shred and I was hurting so bad. I think level 3 yesterday really made my arms and shoulders sore. Yuck. But I survived and I am ready for day 5. This is so much more fun doing this with all of you then just doing it by myself. It also helps that it is a challenge and I love challenges! Not that I can win the great prizes being offered but I just like the challenge. That and I can't wait to see who wins the Makeover from All About You Hair Salon by Joy and the $75 worth of Tupperware from Nyky Crabb and of course the gift basket of my favs! I am going to be so jealous of the winners of this challenge. Just kidding. I am going to be really excited for all of you and myself when we complete these hard 30 Days of The Shred. Ooo! These looks delicious! Thank you so much for sharing! Great job on completing Day 4! I haven't tried the chocolate covered soynuts, but they look delicious. Love your before and after photos. I have something for you at my blog. Come and get it! Day 4 was a little teeny tiny bit easier than Day 3. I thought I would die yesterday, or at the very least, that my legs would melt into puddles of Jello. I'm pretty sure I would have given up if it weren't for other people doing it along side me. Carla - Great job with day 4!